Although it’s hard to believe, Taylor and I are already halfway through our Wildflower training regimens. We’ve sacrificed sleep, bedtimes past 9pm, and in my case, sour candy to make this training cycle a success. Unlike some of our other recent races, the goal at Wildflower is simply to finish and have fun at the Woodstock of triathlons. Taylor will be racing the Olympic and I’m now registered for the Long Course (Half Ironman). From now until Ironman Lake Tahoe, I’ll be posting periodic updates about what’s going well and what I could do better leading up to the big day. 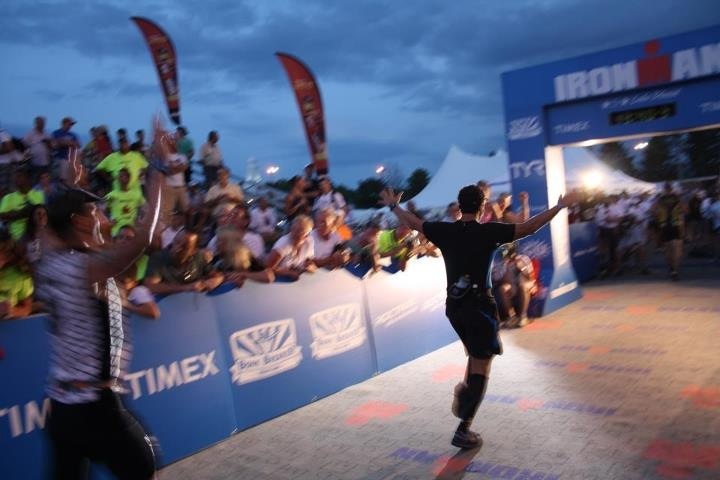 The Good: Already have my finish pose memorized. I’ve been consistent and have logged 10-12 workouts per week for the past 6 weeks. I’ve built my volume up gradually, and am just now reaching my typical weekly running volume (30-40 miles). The catch: I’m also swimming and biking 3 times per week. Last week I logged 5 miles of swimming, 2 hours of intense indoor cycling and a 45 mile long ride, and 35 miles of running. Track workouts are paying off. Between logging 4.6 miles in 30 minutes and 2 miles in 11:58, I’m running faster than ever. Strength training is translating into gains in all three sports. Stretching. What stretching? Unlike my last Ironman training cycle, I’m having a hard time fitting it into my day, and have stretched sparingly since training started. This phase of my plan doesn’t have a dedicated rest day unless there is very heavy volume over the weekend. Although I still have plenty left in the tank, the fact that I’m going 1+ week between rest days is counter to my typical method and something I’m monitoring closely. Starting next Monday, I have business travel planned for the next four consecutive weeks, including a full week in Copenhagen. Fortunately, one trip falls in the week leading up to the Great Race, and one falls the week after, so I’ll have an excuse to pull back and recover. Did I mention that I’m trying eat fewer treats? Nice summery. Those 2 points under ‘bad’ are pretty bad indeed though.. you shouldn’t give up stretching and rest with all the hard work you are doing. Dude, you gave up sour candy? You’re and ANIMAL! 🙂 He gives in now and then.